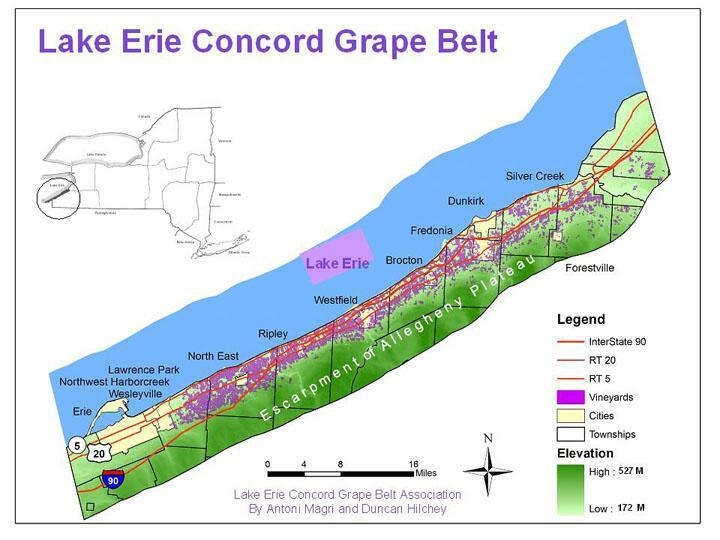 The Concord Grape Belt is located along the southeastern shores of Lake Erie in western New York and northwestern Pennsylvania, and is the largest and oldest Concord grape growing region in the world. The Concord grape is native to North America, and was first selected and propagated from wild seedlings by Ephraim Bull in Concord, Massachusetts in 1849. It was brought to western New York in the 1870's where climate, geography, and soils proved to be very suitable to its production. Established in 2004, the Concord Grape Belt Heritage Association is a 501(c)(3) non-profit organization of grape growers, juice processors and wineries, related grape industry businesses and regional organizations. Our mission is to encourage and support the grape and wine industries within the region, and to enhance the region’s quality of life. In May, 2013, the Grape Discovery Center was opened by the Heritage Association as a showcase for local grape-related products, and as a venue for sharing the rich history and culture of the region.